Repotting a houseplant is often a source of confusion. How do you know when to repot a succulent? Is it simply a matter of pulling it out of the pot and placing it in a larger pot? What kind of potting media should you use? How big of a pot should you use? Keep reading and this post will answer all of these questions and more! There are several very important steps as you proceed to repot a succulent, or any houseplant for that matter, so let’s get started! When Should Your Succulent Be Repotted? Your plant will often tell you when it needs to be repotted. One indication that it needs to be repotted is that the roots will be coming out of the drainage holes at the bottom of the pot. Another indication is that you may notice that your plant is drying out much more quickly that it used to, despite frequent watering. You may notice a very hard mat of roots on the surface of the pot, and very little soil, if any, may be left. There are several very important steps and tips in order to successfully repot your succulent, or any houseplant for that matter! The steps are all the same, except you might be using a different potting mix when repotting a succulent. 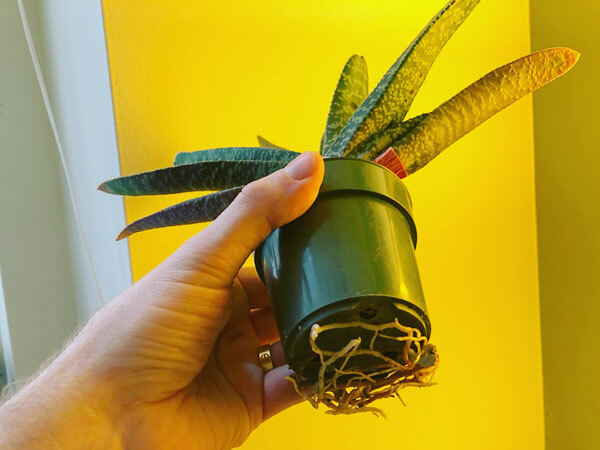 Sometimes if your plant is very pot bound and is in a plastic pot, like the Gasteria above where the roots are coming out of the drainage holes, you may choose to take a good pair of scissors and cut the pot off so that you minimize damage to the roots. 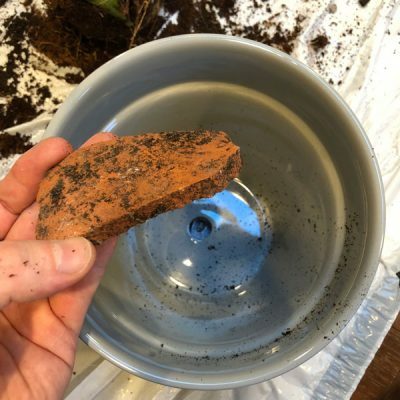 If you have the plant in a terra cotta pot, you can either take a hammer to the pot, or possibly run a knife around the perimeter to gently loosen the root ball so that you can take the plant out of the pot. In extreme cases, I sometimes take a hammer to the pot if it is too difficult! I will then reuse the broken pieces of the pot. Keep reading to see how! The Sansevieria cylindrica below has just been taken out of it’s pot. I used the scissors to cut the plastic pot off because it was too difficult to take out otherwise. This is a critical step that many people miss! 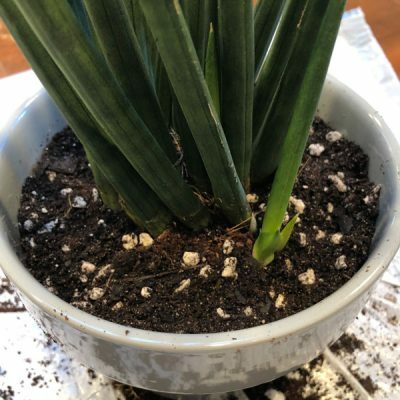 If you don’t loosen the rootball, depending on how pot bound the plant is, you may run the risk of the roots not growing into the fresh soil in a new pot after it has been repotted. I once repotted a large peace lily and after a few years, I noticed it wasn’t doing too well. The plant seemed disproportionately small compared to the pot. I decided to take it out of the pot and place it in a smaller pot. 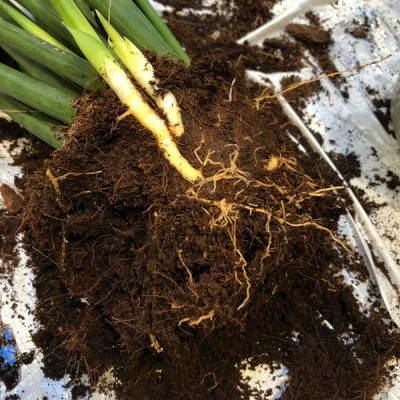 When I took it out, I found that the original root ball had not grown any new roots into the surrounding soil! I had not loosened the rootball. Now I know better! If a plant is not terribly pot bound, you can simply take your hands and gently loosen the rootball. Gently pry the rootball apart all around, and don’t forget the bottom of the rootball as well. Don’t go too crazy, but also don’t worry about breaking a few roots here and there. Your plant will thank you in the long run. 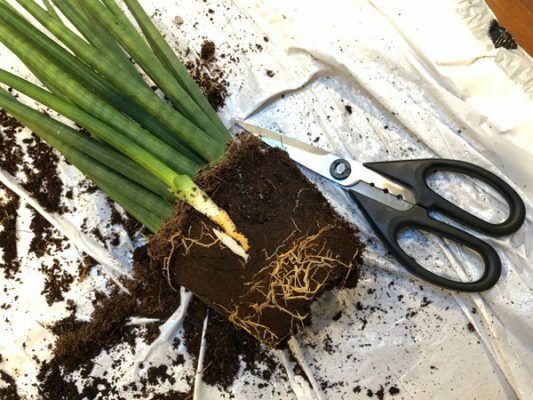 If your plant is SEVERELY pot bound and you can’t loosen the rootball with your hands, then you can use a sharp knife or set of pruners. Take the knife or pruners and make several cuts all around the root ball and at the bottom as well. This will encourage new roots to grow into the new soil after you repot. When you choose a new pot, you only want to go one or two sizes, at the most, larger than your original pot. If you go any larger, you run the risk of the potting media staying too wet. And we all know what happens when succulents stay too wet. You run the risk of rotting. Be sure your new pot has one or more drainage holes. Drainage is so critical for houseplants, especially succulents! I like to add a piece of broken terra cotta over the drainage hole. The curvy part should be down (like an upside down U) so that water can freely drain, but it will prevent too much soil from leaving the pot. 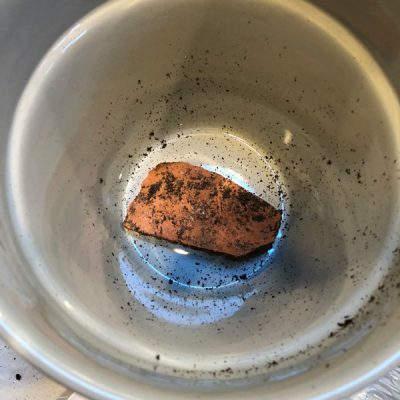 Place the broken piece of terra cotta, or a piece of ceramic pot, right over the drainage hole. As far as potting mixes for succulents, I like to purchase a pre-packaged cactus and succulent mix. There are many great products out there. In addition to this mix, I like to add a handful or two of perlite or pumice. These will add extra porosity to the potting mix, and will also increase the drainage. Both of which are necessary for healthy plants. If you don’t have a cactus/succulent potting mix, you can use a standard houseplant potting mix, but I would absolutely add extra perlite or pumice. Add some potting mix to the bottom of the pot, and visually judge how much you need. Then pick up the plant and gently place it in the pot. Adjust the soil level as needed. I like to leave a little space at the top of the pot so that the soil level is slightly below the perimeter of the pot. This way, when you water, you won’t make a mess and you’ll have a reservoir to hold the water as it absorbs into the soil. Hold the plant in place with one hand, and use your other hand to add soil all around the perimeter of the pot. Gently press the soil down ever so often so that the roots will have good contact with the new soil. Be careful not to leave any air pockets. You are almost done! Now all you need to do is give your succulent a good watering. I like to take mine to the sink, if it is easily portable, and soak all of the soil until water runs out of the drainage hole. Once the plant has fully drained, return the plant back to its normal growing location and you’re all done! You should be good to go for a while now, so enjoy your newly repotted plant and resume your normal care! This entry was posted in Succulents. Bookmark the permalink.